Simplicity. It’s a peaceful word, wouldn’t you say? This one word immediately conjures up feelings of clean, calm, organized and uncluttered…a bright beach side room with sheer curtains dancing in the breeze. 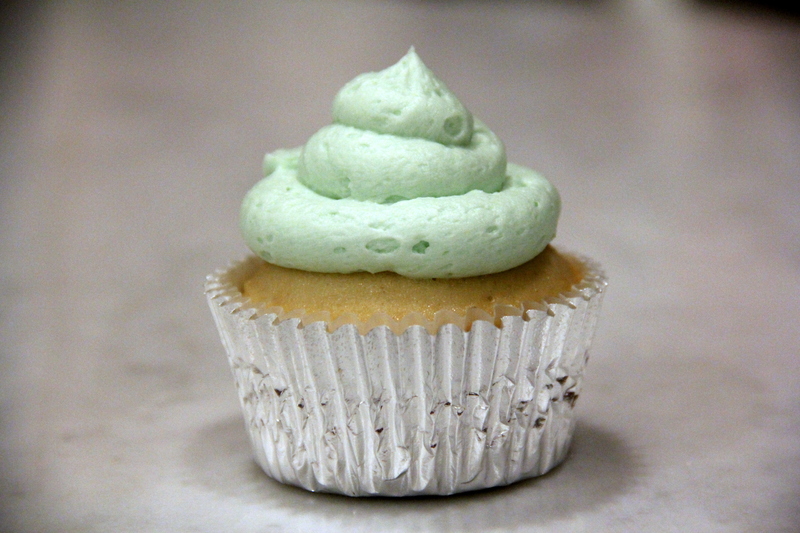 In terms of sweets, the vanilla cupcake with vanilla buttercream frosting embodies every one of those terms. A moist and airy white cake, garnished with a fluffy, sweet, and buttery frosting swirled on top will bring a smile to anyone’s face. Leave out the fancy fillings and omit the distracting toppings. This little one is clean, organized, and simple. Today’s post is dedicated to my mom as today is her birthday and we recently shared these cupcakes together. She gave them very high praise, and although she may have been adding a touch of “this is the best I’ve ever had” because she is a mom, and that is what loving mothers do (simple as that), it made them that much more special to me. So, a cupcake for you mom and cheers to many more~ xo tons. 1. In a bowl combine butter, sugar and salt. Beat until blend. 2. Add the milk and vanilla and beat for an additional 3 to 5 minutes or until smooth and creamy. *Note: The butter and vanilla extract will prevent this from being a true white frosting. Consider this when determining which colors, if any, to add. Blue, will often turn out with more of a turquoise green hue. If you need a true white frosting, this one is not for you. If you need a DELICIOUS frosting, this one is for you! UPDATE: I typically beat on med-high so that the icing is nice and fluffy which creates the air bubbles you see in the picture. This weekend I tried a new technique and just mixed on low for 7-8 minutes which created a nice smooth frosting. Either way tastes DELICIOUS. The technique you use will just depend one your desired look. Preheat oven to 350 degrees F and lightly butter or line 12 muffin cups with paper liners. While eggs are still cold separate the eggs, placing the yolks in one bowl and the whites in another bowl. Cover the two bowls with plastic and allow the eggs to come to room temperature before using (about 30 minutes). In a mixing bowl or whisk together the flour, baking powder, and salt. Set aside. In the bowl of your electric mixer, or with a hand mixer, beat the butter until soft (about 1-2 minutes). Add 3/4 cup of the sugar and beat until light and fluffy (about 2-3 minutes). Scrape down the sides of the bowl. Add egg yolks, one at a time, beating well after each addition. Scrape down the sides of the bowl. Beat in the vanilla extract. Then, with the mixer on low speed, alternately add the flour mixture and milk, in three additions, beginning and ending with the flour. In a clean bowl of your electric mixer, with the whisk attachment, (or with a hand mixer) beat the egg whites until foamy. Add the cream of tartar and continue beating until soft peaks form. Gradually add the remaining 1/4 cup of sugar and continue to beat until stiff peaks form. With a rubber spatula gently fold a little of the whites into the batter to lighten it, and then fold in the remaining whites until combined. Do not over mix the batter or it will deflate. Evenly fill the 12 muffin cups with the batter and bake for about 18 – 20 minutes or until nicely browned and a toothpick inserted into a cupcake comes out clean.